The next time you think hiring a residential electrician in Tampa, FL would be a good idea, give us a call at 5 Star Electrical LLC. In today’s do-it-yourself era, it can be tempting to try to save some money by attempting electrical projects on your own. However, unless you’re simply switching out a lightbulb that’s burnt-out or plugging in a surge protector, seeking the assistance of a residential electrician is probably in your best interest. 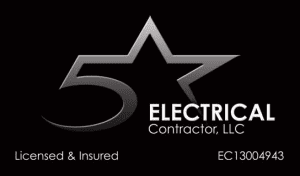 At 5 Star Electrical LLC, we can help you with all of your electrical needs in the Tampa, Florida area for an affordable price and guarantee you’ll be glad that you let us help you with your project instead of trying to tackle it by yourself. As a residential electrician, there are two primary types of services that we provide. The first one is electrical diagnoses and repairs. If there’s an electrical issue in your home that you just can’t seem to figure out, our team of electricians will save you money, aggravation, and time. Thanks to our experience, we’re confident that we can diagnose and repair even the toughest of residential electrical issues. The second main service our residential electricians provide to residential locations is installations and upgrades. With our help, we can prevent your electrical system from threatening your home’s overall safety and also help you take advantage of today’s rapidly advancing technology. Whether you want to install new lighting in your kitchen or protect your entire home from power surges, we’re here for you. The next time you think hiring a residential electrician would be a good idea, give us a call at 5 Star Electrical LLC. We’re eager to earn your business and show you why choosing us to help you with your project is always a smart choice.